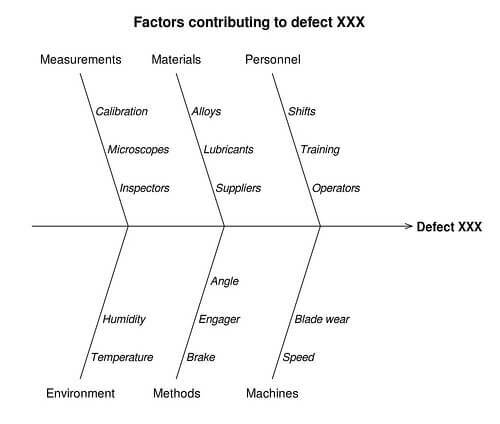 The fishbone diagram or Ishikawa diagram is a cause-and-effect diagram that helps managers to track down the reasons for imperfections, variations, defects, or failures. The diagram looks just like a fish’s skeleton with the problem at its head and the causes for the problem feeding into the spine. Once all the causes that underlie the problem have been identified, managers can start looking for solutions to ensure that the problem doesn’t become a recurring one. can also be used in product development. Having a problem-solving product will ensure that your new development will be popular – provided people care about the problem you’re trying to solve. The fishbone diagram strives to pinpoint everything that’s wrong with current market offerings so that you can develop an innovation that doesn’t have these problems. Finally, the fishbone diagram is also a great way to look for and prevent quality problems before they ever arise. Use it to troubleshoot before there is trouble, and you can overcome all or most of your teething troubles when introducing something new. Karou Ishikawa revived the idea of the fishbone diagram to solve problems at the Kawasaki shipyards in the 1960s, and the idea soon caught on. Even back in the 60s, the fishbone diagram wasn’t anything new. In the 1920s it was seen as an important quality control tool. The iconic Mazda Miata car was designed to overcome the issues identified in a fishbone diagram. Even details such as designing the sportscar’s doors so that the driver could rest his arm on it while driving was taken into account. When it comes to quality and efficiency, variation is your enemy. Whatever your business is, you don’t want to leave anything up to chance. From the moment your client contacts you, a predictable process should be followed with its aim being complete customer satisfaction. Variation in the process will mean variation in the product. Fishbone diagrams help you to determine the variables that may enter the equation. They allow you to make your plans so that you know how to deal with them in such a way that the quality of your final product is still up to standard and without significant variation. Find ways to ensure that people involved in a process know what to do and when to do it. Methodologies: Here, you will consider the need for policies, rules, regulations, or procedures to ensure consistent quality. Machinery: This could be anything from assembly line robots to tools or even computers. Materials: The materials needed to produce a quality product can’t be overlooked. Measurements: How is the process measured and monitored to evaluate quality? The Environment: This includes anything outside the company’s control that may impact on results. When drawing up your fishbone diagram, you can use these six categories to feed into the “spine” of your fish skeleton drawing. The sub-factors can be indicated by similar mini-fish bones attached to the line indicating the category under consideration. Compare this to the more traditional list above, and you will see that this list of things that (mostly) start with “M” covers that list and adds a few more considerations to the mix. The eight Ms are useful, but not suitable for every industry. For example, in marketing, you will need a different set of categories. These are based on the marketing mix. What if your company doesn’t produce a physical product? In this case, use the 5 S method. Problem: My car won’t start. Why won’t it start? The battery is flat. Why is the battery flat? The alternator stopped working. Why did the alternator stop working? The alternator belt snapped. Why was it not replaced? The car did not go for its regular service. Is the fifth why the root cause? It may not be. In reality, you could ask several more “why” questions, or you might find that you have reached the root cause before you reach the fifth “why.” Ideally, identifying root causes should be brainstormed by a team that includes some of the personnel closest to the source of the problem. 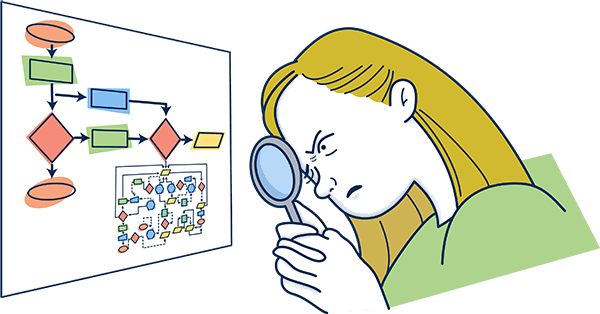 You might be wondering what a workflow engine has to do with the troubleshooting process described so far with fishbone diagrams. As it turns out, quite a lot! Sometimes, when things go wrong, finding out exactly where the problem originated can be a tricky business. However, Tallyfy’s analytics track progress and keeps records that will help you to spot the sneaky serpent in the grass that is causing all your problems. Once you’ve spotted the issue and have investigated its underlying causes, it’s time to close the gap that allowed the variation to creep in with a process improvement plan. Pages related to - Definition – What is a Fishbone Diagram? Definition – What is Nearshoring? ← Low-Code vs BPM Software: What’s the Difference? Tallyfy » Blog » Process Improvement » Definition – What is a Fishbone Diagram?